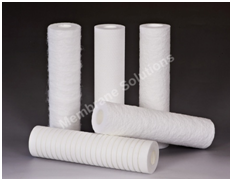 MS® depth filters include many different kinds of cartridge filters such as PP pleated filters, melt blown filters, wound filters and roll type filters. All the depth cartridge elements come in a wide range of materials, lengths, and micron retention ratings. Many cartridges claim to be depth filters with superior dirt holding capacity, but true depth filter cartridges retain a wide range of different sized particles throughout an entire cross section of the filter. 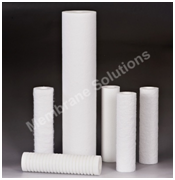 So these elements offer true depth filtration, higher efficiency, lower pressure drop, and greater solids holding capacity than standard elements and competitive prices.